If you follow the news, you’ll be aware of the “Chilcot Report” (named after the British civil servant in charge of the seven-year investigation which led to it), released Wednesday (6 July 2016), which denounced then-English PM Tony Blair’s leading his country into participation in the 2003 invasion of Iraq and toppling of dictator Saddam Hussein. That report naturally gave rise to its greatest impact and public commentary in Great Britain itself – just what that country needed while it was still reeling from the “Leave” Brexit referendum vote. However, we know quite well that it was not British troops alone who stormed across the Iraqi border back in March of 2003. Rather, they were largely American forces, by far – which raises the question of whether there could be an analogous independent inquiry into that invasion over in the US. In any case, George W. Bush hasn’t gotten around to reading the Chilcot Report yet (was really never big on reading anyway). Now, there were also Australian troops in on the Iraq invasion, and the media there is now wondering whether that country now needs its own version of the investigation. But what I want to write about here is Spain, where they are wondering the same thing, reports El País. But here’s the key fact: Spain was not involved militarily in the invasion of Iraq! 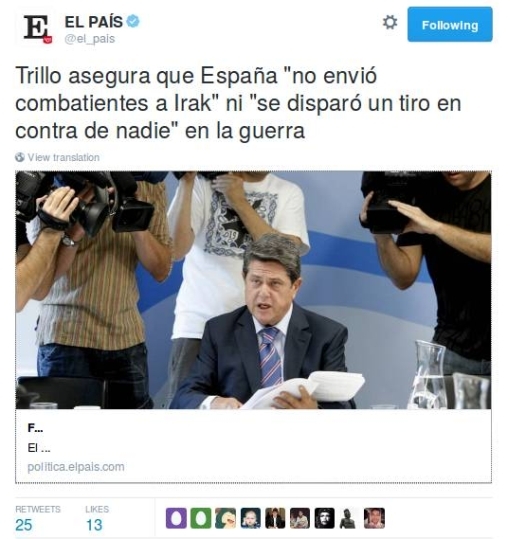 Those quotes you see in the tweet are Trillo’s assurances that Spain “sent no combatants to Iraq,” in fact “never fired a shot at anyone”! Now, it’s true that Spain’s Aznar was quite prominent at the time in backing what were George W. Bush’s clear intention to invade and depose Saddam. In particular, just before the invasion was launched, in mid-March 2003, there occurred a high-profile summit meeting on the Azores Islands (Portuguese territory) featuring Bush, Blair – and, yes, Aznar. Pity poor Federico Trillo – harassed about Chilcot and things he did or did not do back in 2003 when, by all accounts, he’s (basically) innocent – INNOCENT, I tell you! You might ask: “Well, isn’t he out of public life by now, so that he could just demand that the journalists leave him alone?” Sadly, no – in fact, he’s precisely Spain’s current ambassador to the UK! Once the upcoming election has been conducted and the results made known, and as we get closer to inauguration on 20 January 2009, you can expect the usual flood of articles in all the world’s media evaluating the eight-year presidency of the departing George W. Bush. It’s been an eventful eight years, no? For some reason or another, though – apparently because he recently caught sight of Bush on TV looking “tired” and “grey” during his latest address to the nation about the financial crisis – the Frankfurt Allgemeine Zeitung’s Washington correspondent Matthias Rüb has decided to get a jump on the competition with a new piece: What remains of George W. Bush? A man of great expectations. Wow – another EuroSavant post that simply writes itself! This time that delectable characteristic arises from the particular format employed (as you will soon see), and the article in question comes from Information, the Danish intellectual weekly newspaper, with the pungent title 20 reasons for the chaos we find ourselves in (and yes, it’s someone else’s fault). Will Bush Win in Iraq? The “surge” has succeeded, we are all told. Iraq is now a much more peaceful place; the government of Nuri al-Maliki is now in good shape, they say, increasingly able to take over the task of providing internal security with its own native forces. But “they”? “They” is primarily those with an interest in pushing the image of a peaceable Iraq today as a way somehow (and finally!) to justify the expenditure of thousands of American lives, hundreds of thousands of Americans wounded, and hundreds of billions of dollars since March of 2003. In other words, “they” is namely the Bush administration, and also the McCain presidential campaign – and the credibility of at least the first of those has been running on empty for quite some time. The alert is out: the German newsmagazine Der Spiegel snagged a scoop in the form of an interview with Iraqi Premier Nuri al-Maliki, in which (according to a Reuters report) he explicitly endorsed the idea of a 16-month timetable for American troop withdrawal, a plan which has been the centerpiece of presidential candidate Barack Obama’s intentions towards US engagement there. Blogosphere reactions are already here and here (among many others, no doubt, including forthcoming). It has already been well-publicized that President Bush’s first foreign trip of his second term in office will be at the end of next month, an excursion to Europe. He’ll be starting off in Brussels, to try to start mending fences with those of America’s NATO allies who became somewhat estranged over the disagreement concerning the United States’ determination in spring of 2003 to Iraq with its “Coalition of the Willing.” That “Coalition,” you’ll recall, included nations (most notably Britain) which some think should have shown rather more solidarity on the question with their other EU brethren. As if there weren’t enough troubles already in Iraq, another tribe there is now in revolt. And this is among folks who would ordinarily be among the last you would look to for such trouble, the “good guys,” so to speak. I’m talking here about the 1,350-strong contingent of Dutch soldiers stationed there, and that’s a direct quote from the head of their union, the AFMP, W. van den Burg: they’re in opstand, or “in revolt.” What that means in practical terms? Increasing talk about some sort of “strike action,” whatever that is supposed to look like in the middle of Iraq. How are things these days in Fallujah? – you remember, that hotbed of Iraqi resistance activity that needed to be rooted out by the USMC to clear the way for Iraqi citizens peaceably to go to the polls on 30 January? Oh fine, just fine now, reports the US military, even as it denies access into the city to Red Cross officials, not to mention to returning city-residents. The discerning reader is likely to feel rather less-then-fully-informed about the state of affairs there if this is all he has to go on; where is the alternative press when you need it? Le Monde Diplomatique is the leading French opinion-journal on international affairs, but it is a monthly. The November issue was already on the newsstands at the time of the US election. So it’s only now, with the appearance of the December, 2004, issue on the streets and on-line, that we get to hear their reaction to the result. If you keep tabs with the major American press outlets – in this case I’m talking specifically about the New York Times, although the usual line-up of blogs have thoroughly linked to it already – you will have already seen this article on the latest pessimistic assessments from in-country CIA personnel in Iraq. Ultimately though, as President Bush has already pointed out in this context, these folks are just guessing, and their guesses are pretty much as good or as bad as anyone else’s. Late last Saturday the second Dutch soldier to die in Iraq was killed when the convoy of two vehicles he was riding in was ambushed near Ar-Rumaytah in the South of the country . . .
Stop right there, MAO, you interrupt. The second Dutch soldier to die in Iraq? Look, that’s part of the risks for any military contingent that is there. Are we going to get a bulletin on this weblog every time a Dutch soldier bites the dust, just because you happen to live in their country – this when the total of American dead is pushing 950 and counting? Why don’t you favor us instead with accounts of ten US Marines dying in one day (free registration required), but while on the attack – why don’t you give credit where it’s due for real pain and suffering on a somewhat more significant scale? (Back) Into Iraq? Ummm . . . You First! Remember back last winter, when a big fuss hit over the Pentagon announcing a policy prohibiting the awarding of contracts for the reconstruction of Iraq to states which hadn’t been active participants in the Coalition? (€S covered the reaction in both Germany and France.) It sure seemed a good idea then to be among the “ins” rather then the “outs” and so to look forward to the awarding of juicy reconstruction contracts to firms from out of your country.